As our practice manager, Dawn's responsibilities include processing accounts receivable and accounts payable, assisting with account balance monitoring, developing marketing strategies, and making sure our days run smoothly. She has worked in the animal related field for four years and joined our staff in April 2013. Dawn's two favorite aspects of her role at Barrington Animal Hospital are "being around animals and being able to use [her] business skills." At home, Dawn cares for her cat, Spirit, and her dog, Amber. In her spare time, Dawn enjoys boating, traveling and gardening. Veterinary Technician Sam joined our team in April of 2017, and has been working in the in the animal related field for over 13 years. Sam’s daily duties include retrieving patient history, drawing blood, monitoring pets under anesthesia, administering x-rays, reading ear cytologies, and lab work. The part of her job that Sam enjoys the most is interacting and forming bonds with clients and their pets. “Everyone here has the same goal to deliver the best veterinary care and customer service with a compassion,” Sam proclaims. Sam has been a great addition to our tech team. She brings a lot of knowledge and a is great communicator to our clients. She will be a great role model for our team. At home, Sam enjoys baking, traveling, going football and basketball games. She appreciates spending her down time with her loving family and friends. DeeDee joined our team here at Barrington Animal Hospital in May of 2017 as our veterinary technician. Her responsibilities are laboratory work, taking x-rays, anesthesia monitoring, obtaining medical histories, and more. 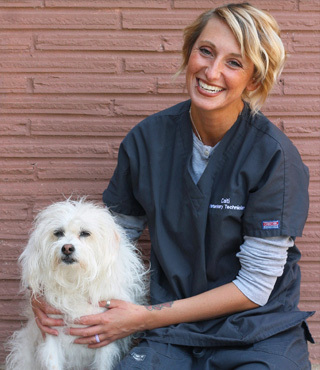 One of her favorite parts of working with us is assisting our doctors in surgery to better the health of your pets. She holds an Associate’s Degree of Applied Science, a Bachelor’s Degree of Fine Arts, as well as the title of certified Veterinary Technician, Associate of Applied Science from Joliet Junior College, and a degree in Veterinary Medical Technology. DeeDee has been working in the animal related field for 4 years with the experience of working with exotic animals. When she’s not spending time bettering our patients, she’s spending time with her own pets – her 13-year-old shepherd mix Harley and 12-year-old chihuahua Gizmo. In her free time, DeeDee loves to paint, read, cook, and go hiking with her fluffy best friends. Bri joined our team here at Barrington Animal Hospital in September 2017 as our veterinary technician. Her responsibilities include patient and client care, surgical assistance, and specimen collection. One of her favorite parts of working here is developing close relationships with the patients and their parents. With her knowledge regarding exotic pets, emergency response, and critical care, Bri is a key component to our team. When she’s not working, Bri enjoys participating in yard sales and flea markets, completing home improvement, baking, and spending time with her family and pets. She has one dog, a Wire-Hair Terrier named Annie, a tripod cat named Elle, a red-footed Tortoise named Rosie, and a Jenday Concure named Norby! Caitlin joined our team at Barrington Animal Hospital in September 2016 and works as a Certified Veterinary Technician. She holds an Associate degree in Applied Science from Joliet Junior College and is a graduate of their veterinary medical technology program. At Barrington Animal Hospital, Caitlin is responsible for assisting with anesthesia, taking X-rays and assisting the veterinarians in a variety of treatments. Her favorite part of the job is interacting with the pets and being able to provide them with a high level of veterinary care. "I love the staff of Barrington Animal Hospital, the high-quality of medicine we provide and the ability to work with the client and their pets," Caitlin says. At home, Caitlin has a 3-year-old domestic shorthair named Bee. She enjoys being outside in the warm weather, going for walks, bike riding and spending time with her cat. 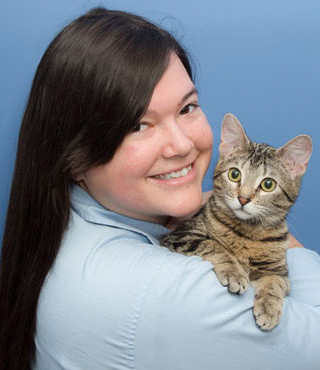 Amanda is a full-time veterinary technician here at Barrington Animal Hospital. She enjoys being a part of a hospital team that provides efficient and exceptional care. Amanda has been in the animal care field since she was 12 years old. She has experience as a junior volunteer, emergency technician, hospital manager and more. When she isn’t working, Amanda enjoys spending her time with her husband in the outdoors. They love fishing, camping, and hunting together. Amanda has an organge tabby cat named Tiger, and a pond with several koi fish and turtles. She also had a dog that recently passed, but can recollect numerous fond memories they shared with one another. In August of 2018 Barrington Animal Hospital welcomed Caitlin W. to our team as one of our full-time Veterinary Technicians. She has been working with animals for over 10 years. She has experience riding and training horses, has worked for numerous animal hospitals both in Wisconsin and here in Illinois. Caitlin loves how Barrington Animal Hospital treats its clients and patients. She considers no two patients to be the same and treats each day as a new adventure. Caitlin is always aspiring to learn something new, and brings with her a humor, passion, and enthusiasm. 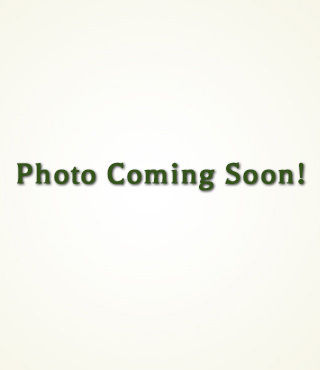 Caitlin is a graduate of Loyola University with a bachelor’s degree in biology and psychology. She is currently enrolled in the CVT program at Penn Foster. Caitlin loves serving as an advocate for animals who can’t speak for themselves. At home Caitlin owns a dog named Bella, two cats named Milo and Moose, a rabbit named Toby, and several horses. She is a member of IHJA and NIHJA, two competitive hunter and jumper organizations. Caitlin is also a supporter of the United States Equestrian Federation and loves riding her horses. She spends her much of her time looking after her children, but she loves painting any opportunity she gets. 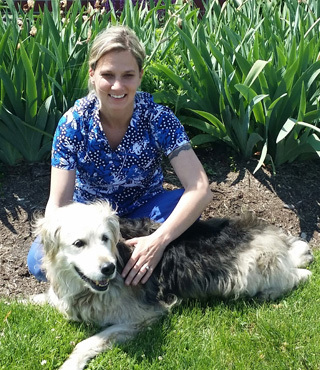 Receptionist Lizzie joined the team at Barrington Animal Hospital in October, 2014 and is responsible for greeting clients, checking in pets, answering the phone, and filing. Lizzie holds a Bachelor's in media arts and animation, and is Barrington Animal Hospital's resident artist. "I can draw caricatures of people and their pet," she says. "I also have mad dance skills. You never know when those might come in handy." "I love working here because the people I work with treat everyone like family," she says. "Plus, work goes by really quickly and is always a lot of fun." Lizzie shares her home with Hiccup, the adorable cat she is holding in the photo. Lizzie likes to spend her free time drawing, sculpting and "being very lazy" with the help of Netflix. Greeting clients and "loving the furry babies" is what Barrington Animal Hospital's receptionist Patti loves most about her job. Her job responsibilities include welcoming pet owners and their pets, checking patients into and out of the hospital, answering phones and filing patient charts. 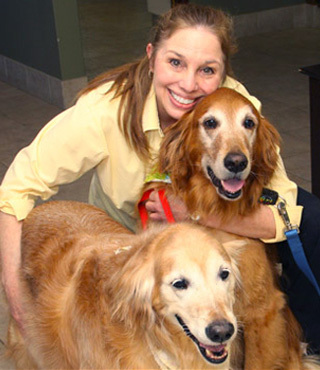 Patti joined our veterinary hospital in August 2005. "Barrington Animal Hospital is a very caring hospital," Patti says. "The staff is intelligent with hearts of gold. We all love what we do and it shows." Patti has two Pit Bull terriers, Wheezy and Capone. In her free time, Patti enjoys her pets, going to the movies, baking, and spending time with her family and grandchildren. As a receptionist at Barrington Animal Hospital, Patti Ann has many duties, including greeting clients and their pets, scheduling appointments, answering phones and ensuring that pet owners have a pleasant experience at our hospital. Patti Ann has a natural gift for making clients smile and we are grateful to have her as part of our team since May 2012. 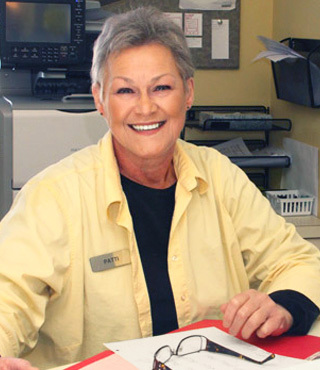 For Patti Ann, it's the family atmosphere that she enjoys most about working at Barrington Animal Hospital. "Ours is not a corporate environment," she says. "Here, the clients are nice people and our hospital environment is very friendly." Patti Ann likes to volunteer for "As Good As Gold: Golden Retriever Rescue" and also enjoys pet sitting and pet walking. She has one Golden Retriever named Alex, and one long-haired cat named Charlie. In her free time, Patti Ann likes baking, gardening, cooking, dining with friends, bowling, dancing, craft shows and movies. 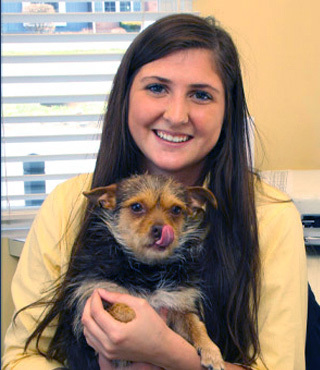 As one of our receptionists, Amy loves talking to clients and getting to know their pets. Her job includes answering phone calls and clients' questions, cleaning our kennel facility and caring for our boarded guests. She joined our Barrington Animal Hospital staff in April 2013. "I love working here because every staff member cares deeply about every animal and client," Amy says. "Everyone is very friendly and helpful and we all feel like part of the Barrington Animal Hospital family." Aside from caring for the pets at our hospital, Amy tends to her own pets: a dog, two cats, a guinea pig, a hamster and "a million" fish. When not at work, she enjoys playing basketball, soccer and volleyball and cooking. "I love the animals!" exclaims Barbara when asked what she likes best about her job. As our receptionist, her responsibilities include greeting Barrington Animal Hospital clients, scheduling appointments, and answering phones. She has a deep compassion for people and their pets. Barbara joined our staff in January 2014. "I simply love animals and I enjoy my job for many reasons, mainly because I work with the best people in the business," she says. 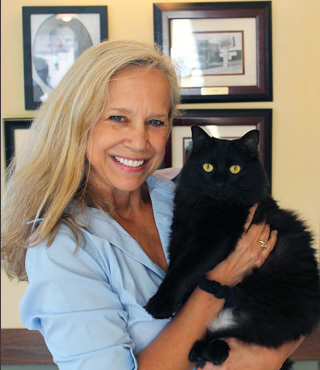 When not enjoying the company of Barrington Animal Hospital clients' pets, Barbara cares for her own: two dogs, a cat, two rabbits, four chickens and two birds. In her spare time, she enjoys spending time with her husband and two children, being outdoors and horseback riding. Receptionist Ladonna joined the team at Barrington Animal Hospital in January of 2016. Her responsibilities include greeting clients and patients, answering phones and scheduling appointments. 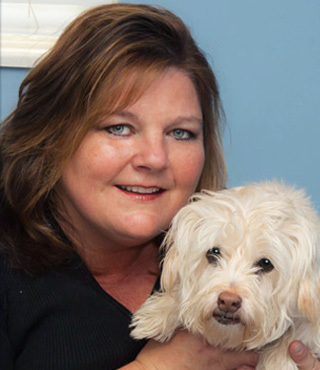 A life-long animal lover, Ladonna came to Barrington Animal Hospital with two years of experience in the animal care field. At home, Ladonna has a chocolate Labrador mix named Sheba. She enjoys exercising, motocross, being outdoors, shopping, traveling, video games, concerts, and spending time with family and friends. Maureen joined the staff at Barrington Animal Hospital in July 2016. As a receptionist, she is responsible for greeting clients and patients and checking them in, scheduling appointments, managing records, processing payments, testing results, and overseeing food and medication sales. Maureen's favorite part of the job is greeting the clients and their pets. She has always been an animal lover and considers every encounter a gift. Prior to joining the hospital, Maureen earned a college degree from Mundelein College in Chicago. She's worked in customer service most of her life, and has a natural desire to help everyone. Combining her helpful nature and her love for animals makes Maureen a great addition to the hospital's staff. "I love working at this veterinary hospital because of the people," Maureen says. "The doctors are top-notch, kind and compassionate; the technicians are patient, gentle and highly-skilled; and the receptionists and management are some of the best people I have ever known. I'm so lucky!" 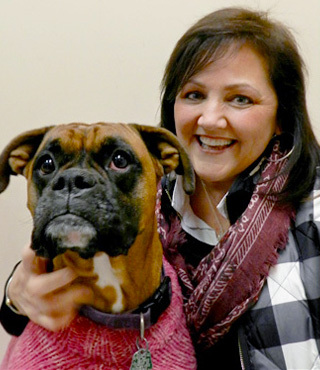 At home, Maureen has a 2-year-old Boxer named Brandy. She enjoys walking, bonding and laughing at Brandy's clown-like behavior. Maureen also enjoys boating with friends, gardening, traveling and cooking. She has a part-time job as a teacher's assistant in a special needs preschool classroom. As one of our phenomenal Receptionists here at Barrington Animal Hospital Deirdre has shown herself a great help around the hospital. Deirdre is responsible for greeting and checking in our clients with a welcoming smile, administering effective client correspondence, organizing and managing medical and client records, billing, and much more! It is safe to say that with her 20+ years of work experience in the veterinary industry that Deirdre is an incredible asset to our team, our clients, and our patients. One of the more rewarding aspects of Deirdre’s job with Barrington Animal Hospital is being able to regularly see and communicate with our wonderful clients. 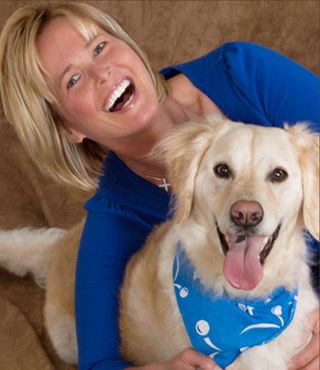 She loves having the ability to form meaningful bonds with our clients and their amazing pets. Deirdre also enjoys being a part of such a stellar and devoted team of animal care providers. In her time away from the hospital, Deirdre loves to practice gardening, going to CDR shows, dog shows, and cat shows. She also loves attending country music events, spending time fishing, camping, or going bowling. Deirdre owns 2 dogs, 3 cats, and 1 fish. Deirdre has been training and breeding for over 40 years and has participated in numerous shows. Kayla joined our Barrington Animal Hospital staff in January 2016. She earned her bachelor's degree in environmental studies, with a minor in photography, from DePaul University in Chicago. Her past animal-related experience includes volunteering at a shelter for rabbits and completing a six-month internship at PAWS Chicago. "I have a bunny who I’m obsessed with," Kayla says of her grey Netherland dwarf-Polish mix named Luxe. She also has another rabbit named Cyrus, and a three cats who go by the names of Lola, Wyatt, and Pretty Kitty. Her hobbies include learning about sustainability and nature, being outdoors, DIY crafts and taking photographs. In her spare time, Kayla has a pet setting business here in Barrington called Watching Whiskers. As a Kennel/Veterinary Assistant, Cindy’s responsibilities include feeding, walking and bathing the animals, monitoring their health, eating habits and behavior while boarding and performing sanitation for all areas of the facility. She assists the veterinary technician with animal restraint when examinations and injections are performed, wound care, and during testing, such as x-rays. Cindy joined our staff in May 2011. 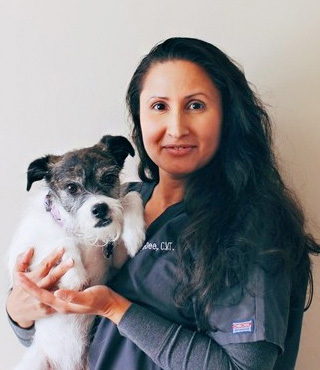 "I love working at Barrington Animal Hospital because we are all a team with a common goal: to be a quality medical practice and protect the wellness of our clients' pets," Cindy says. At home, Cindy cares for her Miniature Goldendoodle, Scarlett (O’Hara) , and her tabby cat, Emmett. In her spare time, she enjoys walking Scarlett, exercising, fostering dogs, volunteering at a rescue shelter and spending time with her daughter and son. Since joining the team at Barrington Animal Hospital in March of 2015, Andrew has been charged with duties that include feeding the animals, cleaning cages, and cleaning offices and other areas of the animal hospital and kennel. 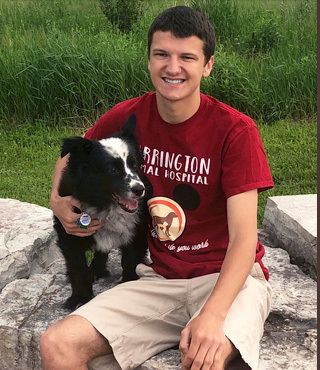 "Working at a practice like Barrington Animal Hospital is fantastic, because it gives me great opportunities for one-on-one interaction with dogs and cats, and their owners," Andrew says. In his free time, Andrew enjoys going to the movies and hanging out with his friends. He's the pet parent to a variety of fish, a guinea pig named Calix, a dog named Panda, and two cats named Sasha and Callie.